We all woke up around 8ish-9ish this morning. We didn’t have a real plan in place. We wanted to keep the decisions of what to do up to Rebecca and how she was feeling. Mr. B whipped up some south western egg whites and I cut up a nice fresh Korean watermelon for breakfast. Eventually we formulated a plan to see all the marketplaces in Seoul. We got everything together and were out the door around 11:30 with the GPS set to direct us to Seoul. Please disregard the worst farmers tan ever that I’m sporting in my photos. Come on folks, I’m trusting you now! We hit Namdaemun Market, Dongdaemun Market, Myeongdong, Cheonggyecheon Stream, and walked down the center of Seoul as the sun went down outside of Gyeongbokgung Palace. We spent the afternoon lunching on street vendor food, shopping, exploring a bit, snapping photos, and soaking up the sunlight. The weather was gorgeous, we traipsed our little butts about 8 miles around the city. As the sun went down, Rebecca said the city started to really take on a different vibe. We agreed, we love Seoul during the day, but really love Seoul light up shining brightly at night too. Even after being here for over a year, we still get the same feelings of excitement while wondering around Seoul. Needless to say we were all thoroughly enchanted. 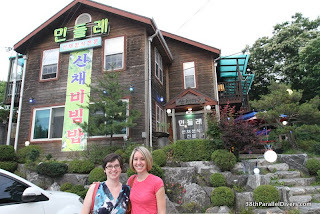 We ended our Seoul Backpack Bees tour in Itaewon over a delightful Thai dinner. We never ate at the restaurant, My Thai, it turned out to be rather delicious! We ordered pineapple fried rice, a spicy Thai noodle dish, and pad thai with shrimp. It was getting late, we still had to drive home, we were all pretty exhausted. An hour and a half later we arrived home at midnight and all decided to retire to bed. What an amazing day! Can this week not ever end, pretty please? !